About 65 percent of people sometimes or often experience abdominal discomfort after drinking a glass of milk or eating cheese. Difficulty digesting the sugar (lactose) found in dairy products is called lactose intolerance. Normally, an enzyme called lactase, which is produced in the small intestine, breaks down lactose. People with lactose intolerance don?t produce enough of this enzyme. Because their bodies can?t break down lactose properly, it arrives in the intestines undigested. Bacteria in the gut feed on the lactose, which produces uncomfortable symptoms like abdominal bloating and pain, gas, nausea, and diarrhea. Symptoms usually start between 30 minutes and 2 hours after eating lactose-containing foods. In most people, lactose intolerance has genetic origins. However, it may also be triggered by disease or injury to the small intestines. Doctors diagnose lactose intolerance with a hydrogen breath test. After you drink a beverage containing lactose, you breathe into a container. Then, the doctor tests how much hydrogen is in your breath. Undigested lactose will produce larger-than-usual amounts of hydrogen. In children, doctors sometimes use a stool acidity test, which measures lactic acid?a type of fatty acid produced by undigested lactose. You can manage lactose intolerance by limiting or avoiding foods containing lactose. Dairy foods such as milk, cheese, and ice cream are the most obvious sources, but lactose can also hide in foods where you wouldn?t expect it. Baked goods, breakfast cereals, soups, potato chips, processed meats, salad dressings, protein powders, candy, and some medications also contain lactose. Lactose limitations should be individualized, because some people can tolerate more lactose than others. 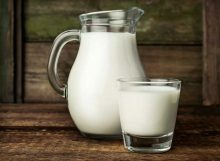 To prevent deficiencies of calcium and vitamin D, anyone with lactose intolerance who is avoiding dairy should eat and drink alternative sources of these nutrients, such as lactose-free dairy products and soymilk. 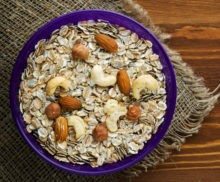 The market for plant-based alternatives to dairy products continues to grow, as lactose intolerance, dairy allergy, veganism, environmental concerns, and other factors lead Americans to look for alternatives to dairy. So where do these beverages fit into a healthy dietary pattern? From elaborate brunches to elegant evening meals, the holidays are filled with opportunities to enjoy culinary creations. But, if you easily get bloated and gassy, eating at holiday gatherings may make you a little nervous.